The annual Super 24 dance competition was a sold-out affair this year, with 24 dance crews wowing avid dance fans in a hot contest. Dance Prcs from Pasir Ris Crest Secondary. Twenty-four dance crews battled it out for top honors at the annual Super 24 competition on 6 August. The annual dance competition, which has grown exponentially since its first year in 2012, is organized by performing arts centre and social enterprise O School. The rules: each team comprises 24 members within an eight-by-eight meter square dance floor, performing a 90-second routine. Year after year, teams unleash always-surprising creativity and unity within these constraints. Judges are stationed at all four sides of the square so every dancer is scrutinised, further driving home the underlying value of Super 24: that everybody counts. It is an important truth within the family, corporation and society at large that the organizers set out to reinforce. Besides creativity, teams were judged on aspects including teamwork, energy, technique and showmanship—one team infused Bollywood dance moves into its choreography to cheers of surprise from the crowd, while another had its male members dancing in heels. Temasek Freestylers from Temasek Secondary School. Crowd favourite and last year’s champions in the Secondary School category, The Temasek Freestylers from Temasek Secondary School, put on a comedic choreography that kicked off with a dancer looking for a lost shoe. 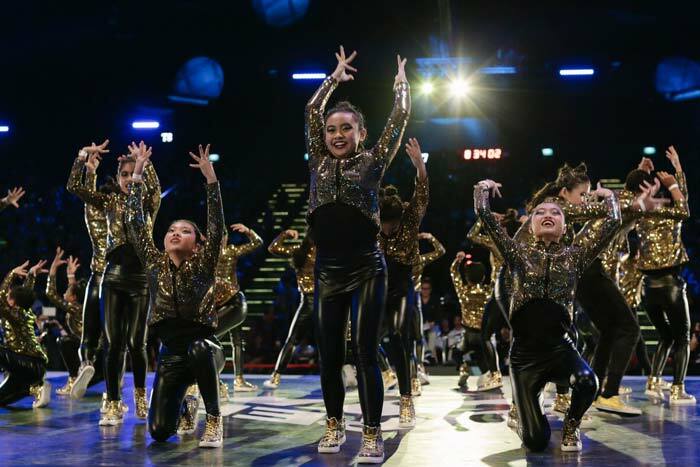 This year’s championship went to Dance Prcs from Pasir Ris Crest Secondary—the dancers’ gold-sequinned costumes amplified their high-energy arm movements to stunning effect. In the Open Category, it was a close fight between the fierce romping choreography of Majestique (fittingly set to “Formation” by Beyoncé) and the fluid, acrobatic moves of Viktorias—and Viktorias that clinched the title. Majestique from the Open Category. The winner of the Tertiary category was Style Groovas Crew from Republic Polytechnic, who put up a super-slick show capped with a daring mic toss at the end. “Like last year, it was an evening full of energy, creativity and phenomenal dancing skills at the highest level,” says a Mrs Yu, who was there to support her daughter who was a dancer in the Secondary category. Viktorias who won the Open Category.